Every flutist has probably played or seen a piccolo. Not every flutist has played or seen an alto flute. 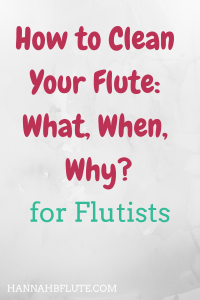 While low flutes (like alto and bass) are becoming more common, they are still a mystery to many flute players. The 2018 NFA convention is less than two weeks away, which means you are probably thinking about your travel plans. Hopefully, you already have everything set, but you still might be worried about flying with your instruments. As flutists and other woodwind players know, you can’t always get away with playing just one instrument. Especially for music majors and professionals, the benefits of doubling are numerous. Once you reach proficiency on the flute, it can be time to think about adding other “auxiliary” flutes to your inventory. Piccolo and alto flute are the two most common ones. So I want to share my thoughts on piccolo vs alto flute. Some people will gravitate heavily towards one or the other. Some people might want to learn both. Others still might want to stick to the C flute. If you have read my blog before, you probably already know I have a passion for the piccolo. I love the small size and being able to float above an ensemble. If you are unsure of which auxiliary flute to learn, I am going to break it down. Piccolo vs Alto Flute. The piccolo is small. Even smaller than the concert flute. It can fit in almost any purse or bag. You can take it with you anywhere. It is super easy to just throw it in your bag with your flute. The piccolo is *relatively* affordable. Piccolos start at around $400-500. Used piccolos can start even lower, but be cautious when buying used. My first piccolo was used, and it cost just under $300. The piccolo has a growing repertoire. The piccolo is the most common auxiliary flute, so you will find more music for it than the alto or bass flute. There is not a ton of piccolo specific music, but most flute music will transfer over. And the piccolo repertoire is growing more and more each year. The piccolo is common. You will find a piccolo part in most band pieces, a lot of symphonic orchestra works, and in quite a few flute choir pieces. If you are in a college marching band, you can also play it there. Most of the ensemble pieces I played in music school had a piccolo part, even if it was combined with flute. The piccolo is high pitched. I’m sure this is obvious, but the piccolo is a high pitched instrument. To avoid hearing damage, you need to wear earplugs. If you don’t like playing either the melody or other high parts, the piccolo isn’t for you. On piccolo, I often play the melody or a descant part that sits on top of the melody. The piccolo is finicky. Since the piccolo is a small, high pitched instrument, it is very temperamental. Any tuning issues you have are magnified on piccolo. It can also be very easy to bend the mechanism during assembly or disassembly. The piccolo is not a respected solo instrument. I would like to change that. There are a few great works for piccolo, and I would love to be able to give the piccolo a greater place in solo performance. However, the piccolo is not a common solo instrument. The piccolo can crack. If you get a piccolo made of wood, it can be susceptible to cracking. In extreme weather, wood can crack and cause tuning and playing issues for the piccolo. If you will be playing indoors and out, it is best to get a composite piccolo or a composite for outdoors and a wood one for indoors. Related: Should You Play Piccolo? The alto flute is lower in pitch. If you love the sound of the flute, but you don’t care for the higher notes, the alto is perfect. It is pitched a fourth below the C flute, so you play a little lower. The alto flute comes with two headjoint options. If you have longer arms, you can get a straight head alto. If your arms are shorter, you can get a curved head. Each style does have different tendencies, but the flexibility is definitely a benefit to the alto flute. The alto flute is unique. That could be taken as a euphemism for uncommon, but it’s true. Not many people play the alto flute, and even fewer people own an alto flute. 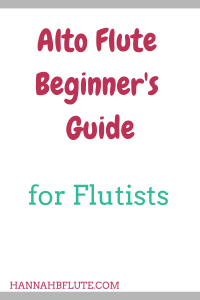 Playing and owning an alto flute can be a great way to stand out as a flutist. The alto flute is becoming more common. I know more and more flutists who are buying their own alto flute. The repertoire is growing (though slower than the piccolo). Most flute choir pieces call for an alto flute. The alto flute is uncommon. While the alto flute is prominent in flute choirs and has a growing solo repertoire, it is still uncommon in other settings. Very few orchestral pieces call for alto flute. I can only think of one band work with alto flute. It’s just not as common as the piccolo or C flute. The alto flute is more expensive. One factor that can prohibit the purchase of an alto flute is the price. The lowest cost for an alto I have seen is around $1500. The price just goes up from there. If your budget is a big concern, the alto flute might not be the best purchase. The alto flute is big. If you choose a straight headjoint, you will need quite an arm’s reach to play it. If you choose a curved headjoint, the balance can be awkward. With either headjoint, the alto is going to be bigger. You can’t just throw it in with your flute on your way to rehearsal. 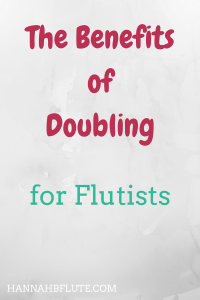 Each flutist is different. We all have different interests and different budgets. We also all have different goals for our flute playing, from fun to a full career. I don’t want to give a single answer as to the better choice, so here is what is better for certain groups. For flute majors and serious flute students: Go for the piccolo. It will serve you more in ensembles and solo performances. It is also more affordable than the alto flute. If you need an alto flute, you can probably borrow one from your school. For adult amateurs: You decide. If you play more in community bands and orchestras, then piccolo. If you play in a flute choir, choose the alto flute. 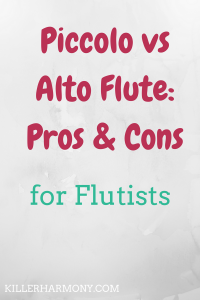 For semi-pro to professional flutists: Both, because the piccolo is almost expected of all professional flute players, and the alto flute will add to your marketability. When starting your career, you don’t need the most expensive model, but you should have both a piccolo and an alto. If you can’t afford both immediately, then get the piccolo first and save for the alto flute. I definitely do have a preference for the piccolo, but I do enjoy the alto flute. This holiday season, I think I might have to treat myself to an entry level alto flute. I’m out of school, and I would like to become a professional flutist. I need both a good piccolo (I own one) and a good alto flute to remain competitive in the current world of professional flute playing. 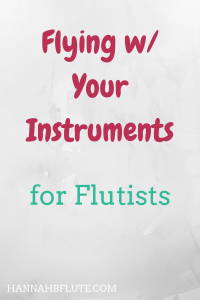 Do you have a piccolo or alto flute? What are your thoughts? Let me know in the comments!